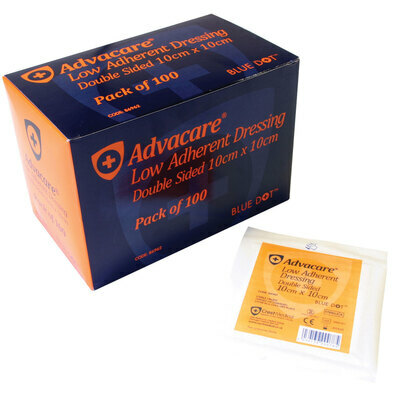 Ensure your First Aid box is always kept fully stocked up with our Low Adherent Dressing Pads. Developed for use in a wide range of work environments, these sterile dressing pads are made from a soft and absorbent material that cushions any wound. From abrasions and lacerations through to moderately discharging wounds, they are double sided to eliminate the risk of incorrect application and can be secured in seconds using tape or a conforming bandage. Simply layer on top of your would to install a barrier between additional dirt while also drawing away discharge while the wound heals. Each dressing is individually wrapped for exceptional hygiene and comes in a durable cardboard box that can be stored away until required. In addition to these pads, we also stock everything from Adhesive Sterile Dressing Pads through to Microporous Tape and Mefix Surg Tape - all at exceptional wholesale prices.